1. 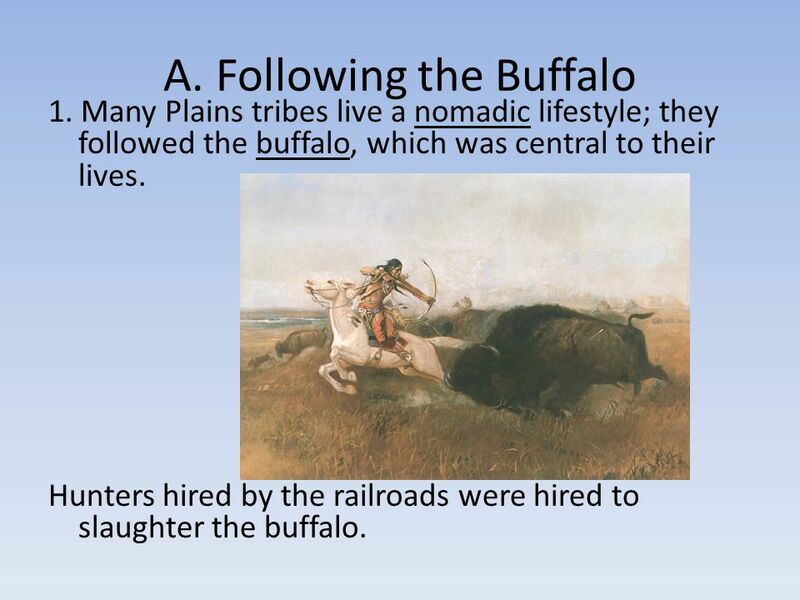 Many Plains tribes live a nomadic lifestyle; they followed the buffalo, which was central to their lives. Hunters hired by the railroads were hired to slaughter the buffalo. 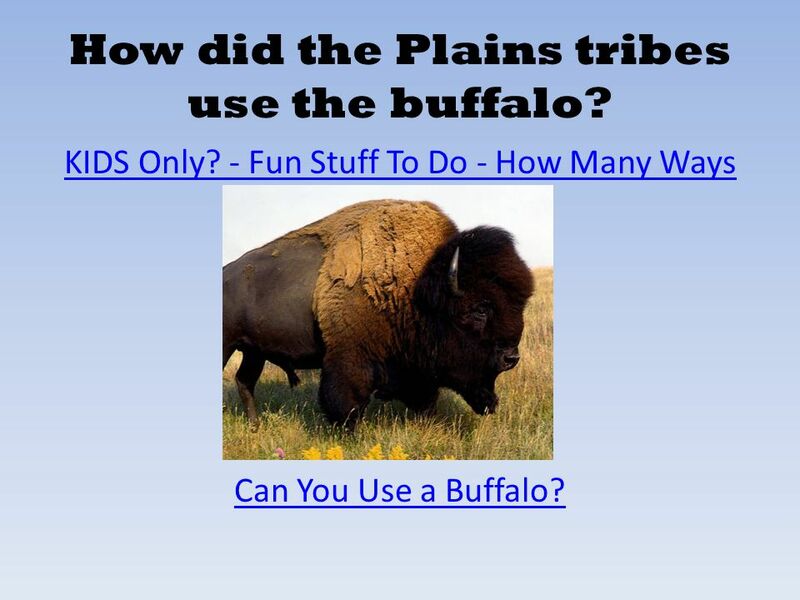 3 How did the Plains tribes use the buffalo? KIDS Only? - Fun Stuff To Do - How Many Ways Can You Use a Buffalo? 4 B. Conflict 1. For years, whenever settlers moved west, Native Americans were forced onto land put aside for them called reservations. 2. Most Indians were moved to the West. 3. 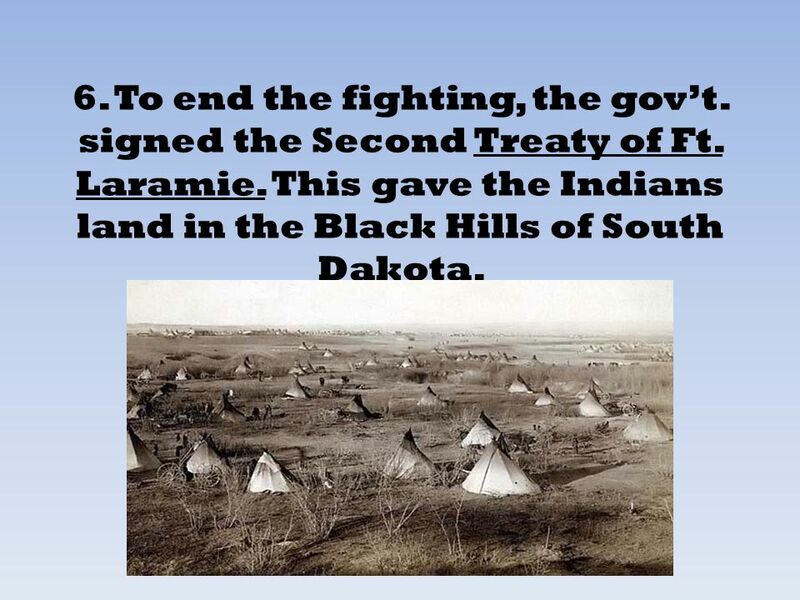 As settlers moved onto this land, Indians were forced to sign the First Treaty of Ft. Laramie, which allowed the gov’t. to buy back some of the land. 6 4. 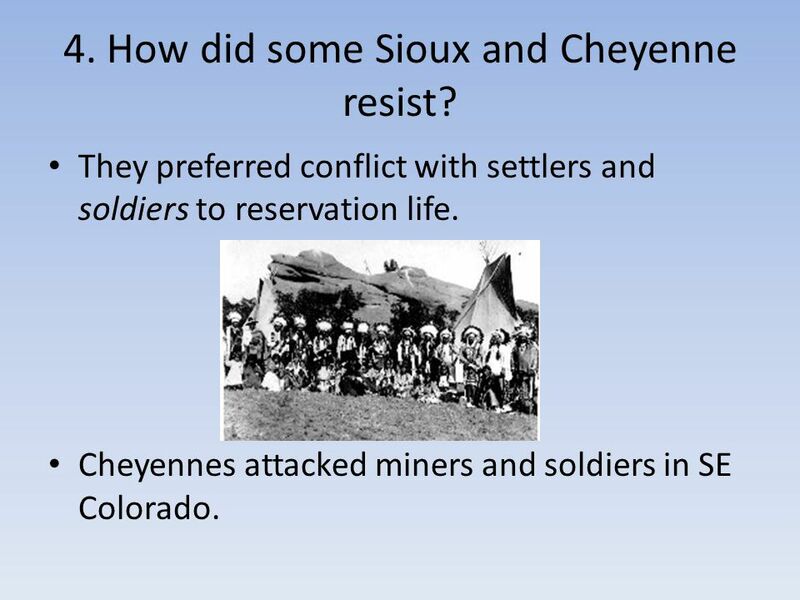 How did some Sioux and Cheyenne resist? They preferred conflict with settlers and soldiers to reservation life. Cheyennes attacked miners and soldiers in SE Colorado. 7 5. 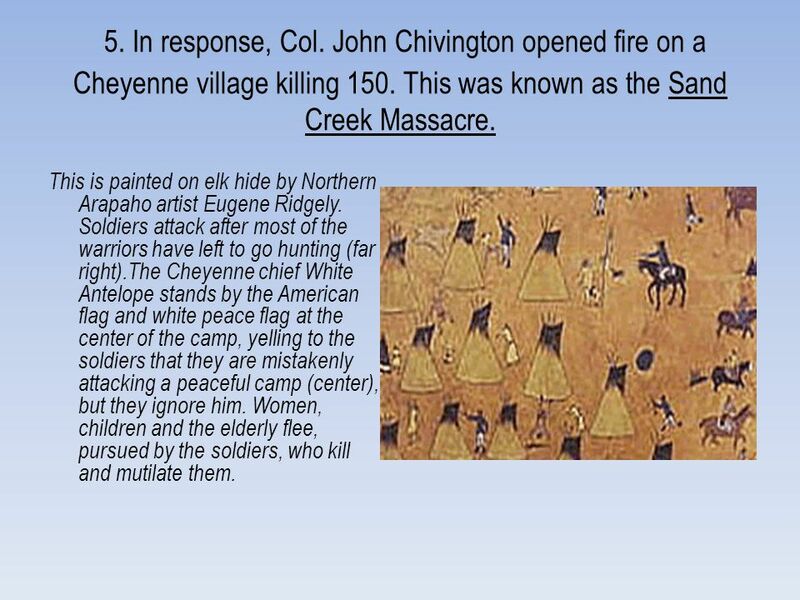 In response, Col. John Chivington opened fire on a Cheyenne village killing 150. 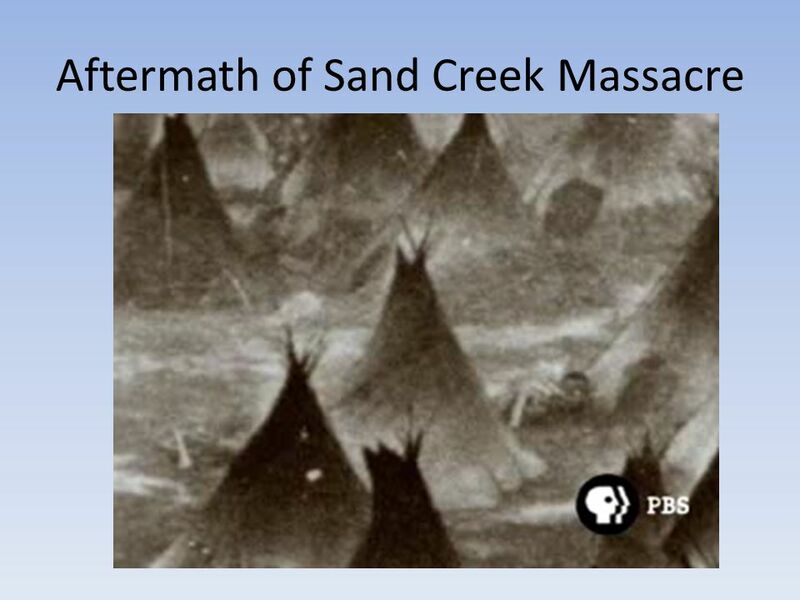 This was known as the Sand Creek Massacre. This is painted on elk hide by Northern Arapaho artist Eugene Ridgely. Soldiers attack after most of the warriors have left to go hunting (far right).The Cheyenne chief White Antelope stands by the American flag and white peace flag at the center of the camp, yelling to the soldiers that they are mistakenly attacking a peaceful camp (center), but they ignore him. Women, children and the elderly flee, pursued by the soldiers, who kill and mutilate them. 6. To end the fighting, the gov’t. 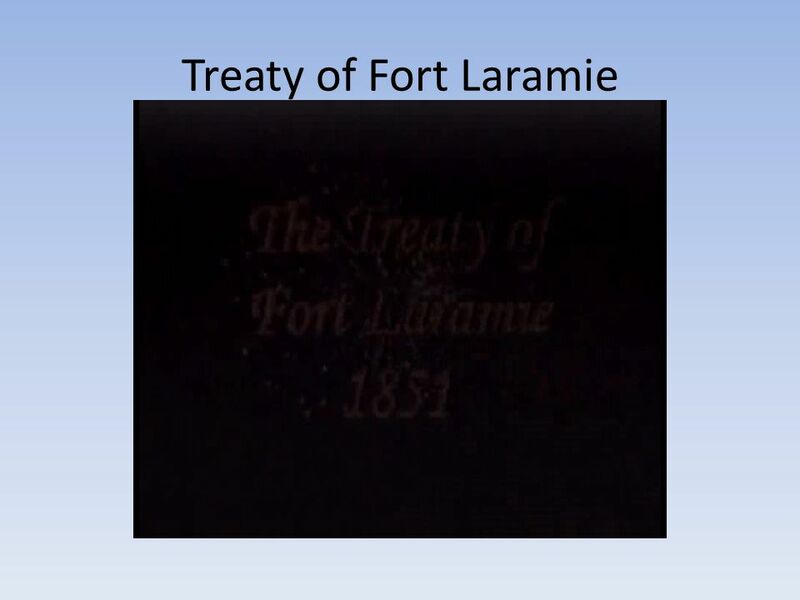 signed the Second Treaty of Ft. Laramie. This gave the Indians land in the Black Hills of South Dakota. 11 7. 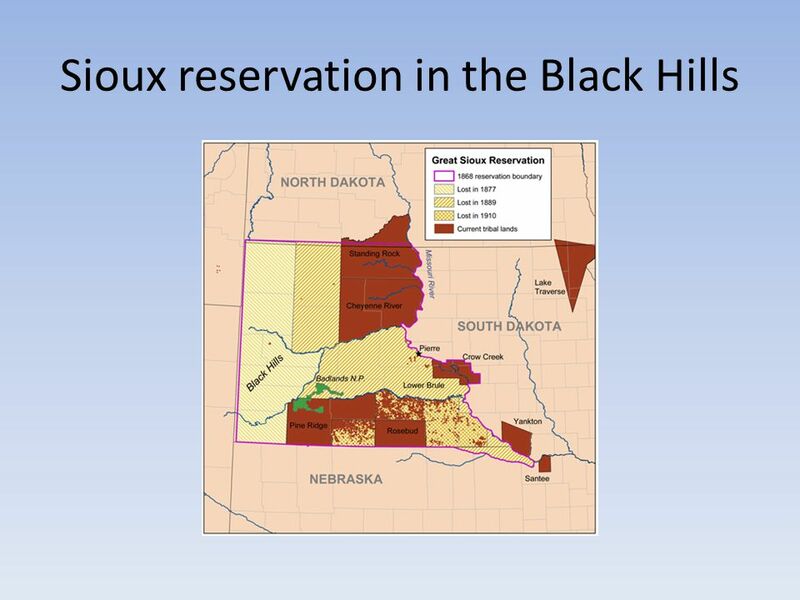 What happened in the Black Hills that caused settlers to violate this treaty? 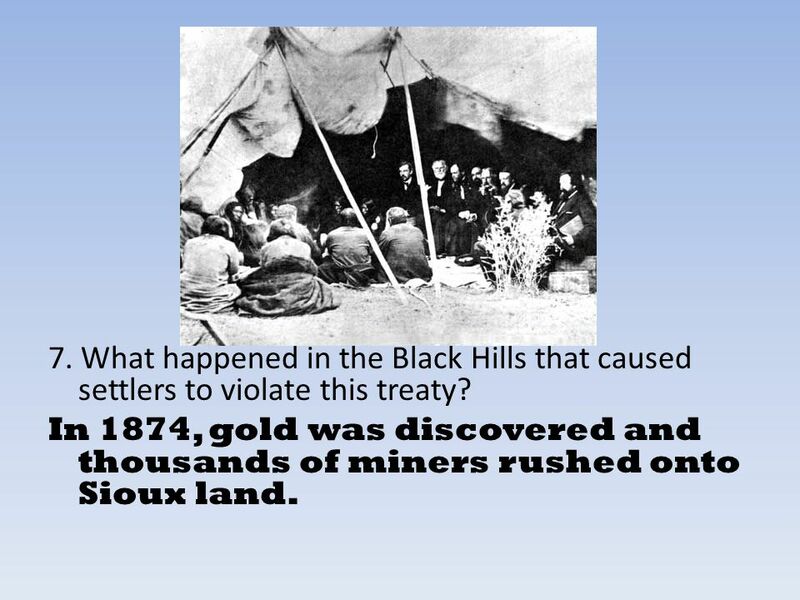 In 1874, gold was discovered and thousands of miners rushed onto Sioux land. 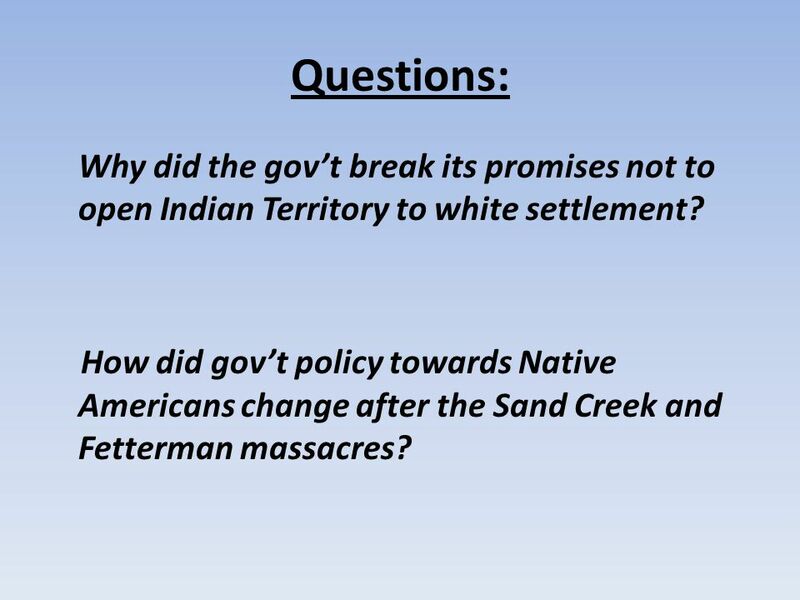 13 Questions: Why did the gov’t break its promises not to open Indian Territory to white settlement? 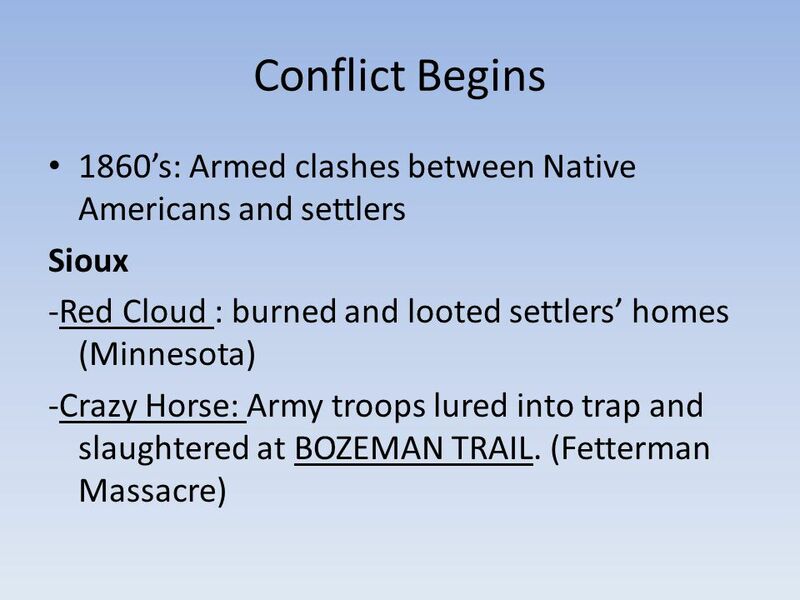 How did gov’t policy towards Native Americans change after the Sand Creek and Fetterman massacres? 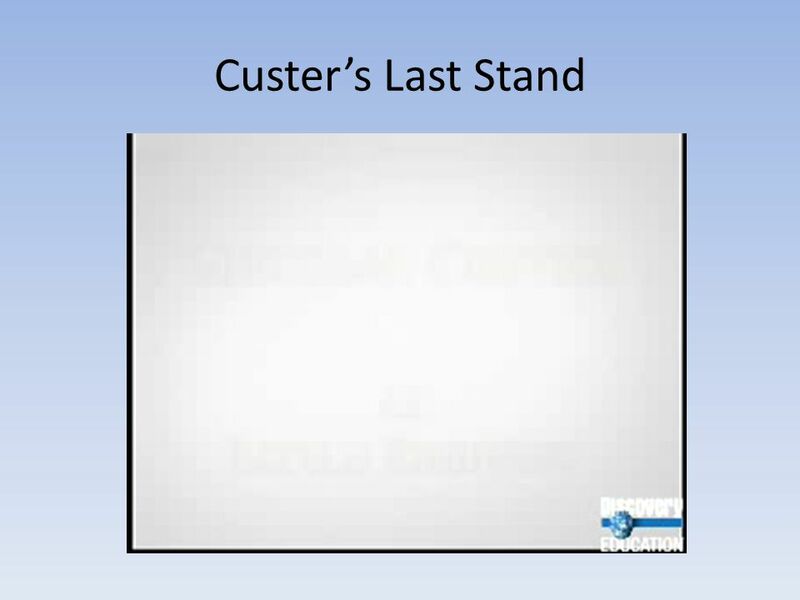 As the Sioux left their reservations, the 7th Cavalry, led by George Custer was sent to bring them back. 16 2. 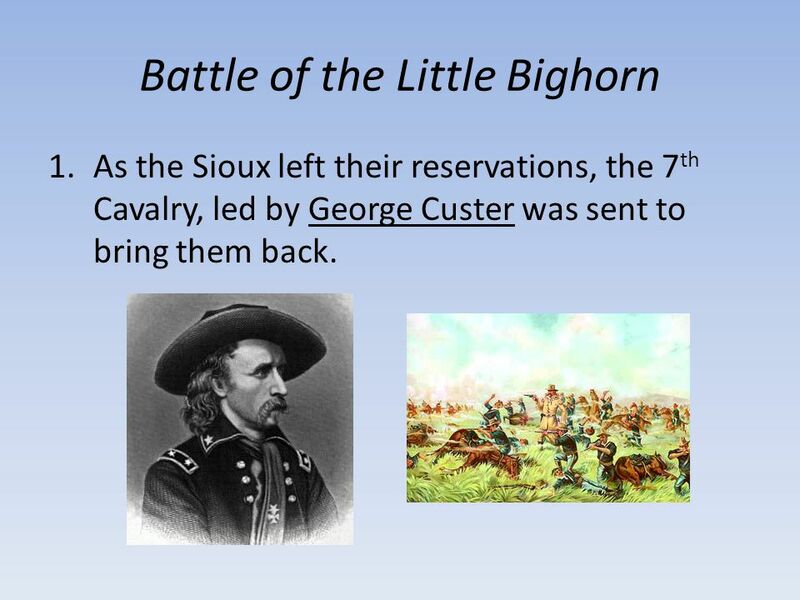 His forces were surrounded by the Sioux at the Little Bighorn River in Montana and all 211 men were wiped out. 3. 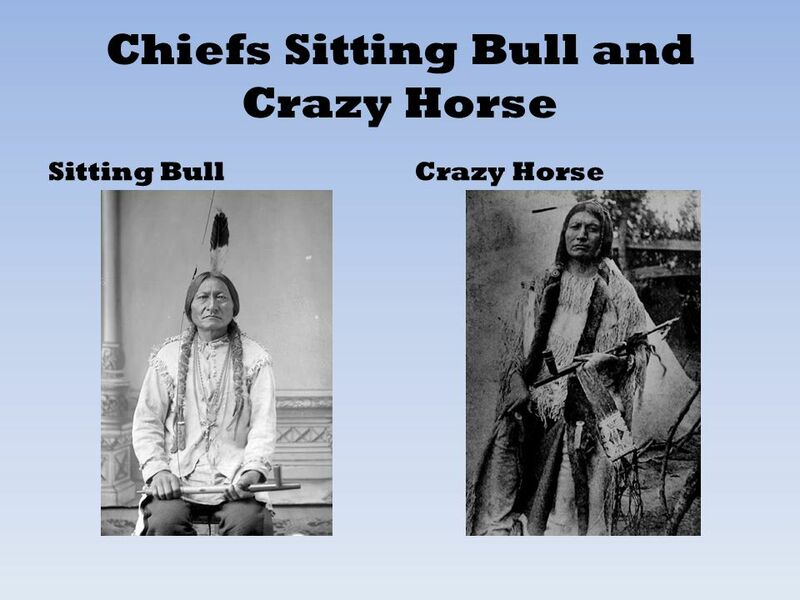 What eventually happened to Sitting Bull and Crazy Horse? 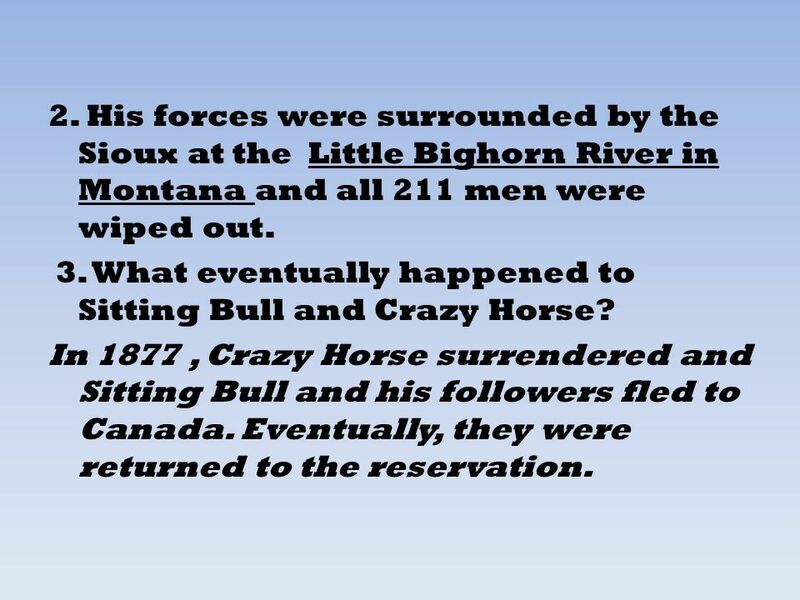 In 1877 , Crazy Horse surrendered and Sitting Bull and his followers fled to Canada. Eventually, they were returned to the reservation. 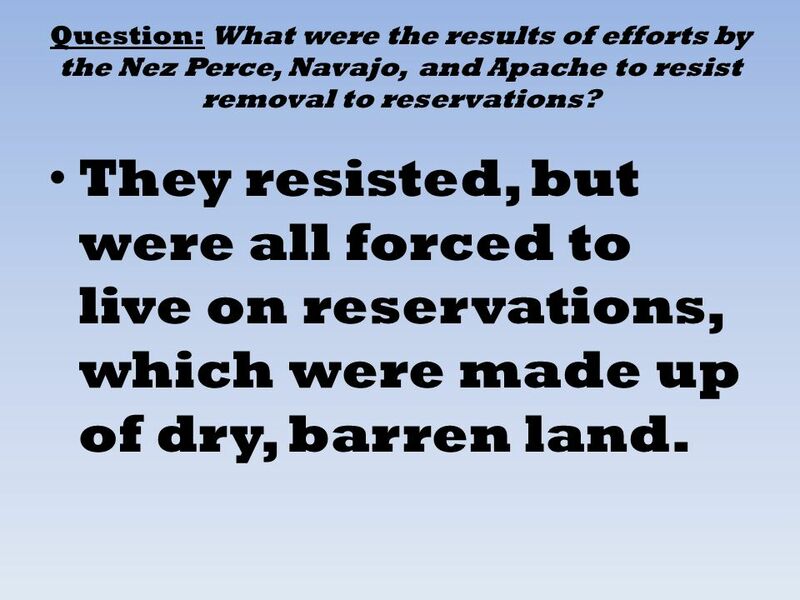 18 Question: What were the results of efforts by the Nez Perce, Navajo, and Apache to resist removal to reservations? 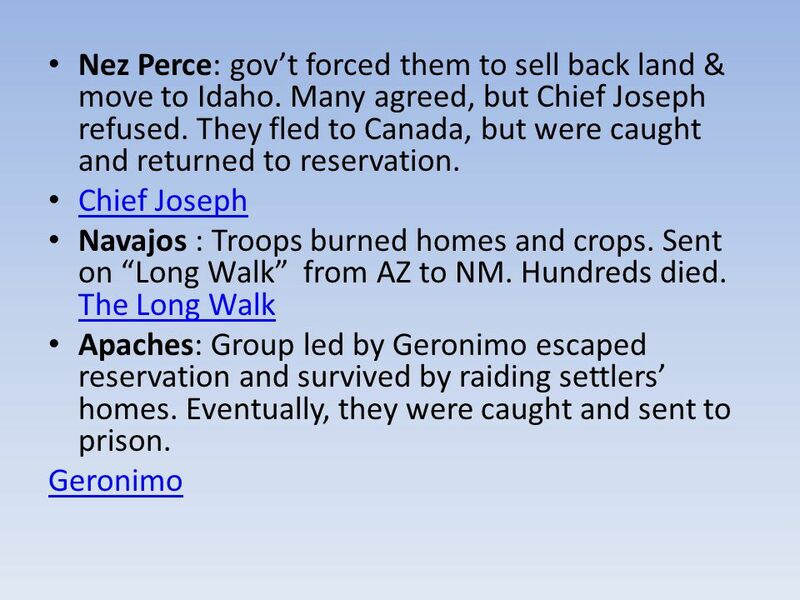 They resisted, but were all forced to live on reservations, which were made up of dry, barren land. 20 C. A Way of Life Ends 1. 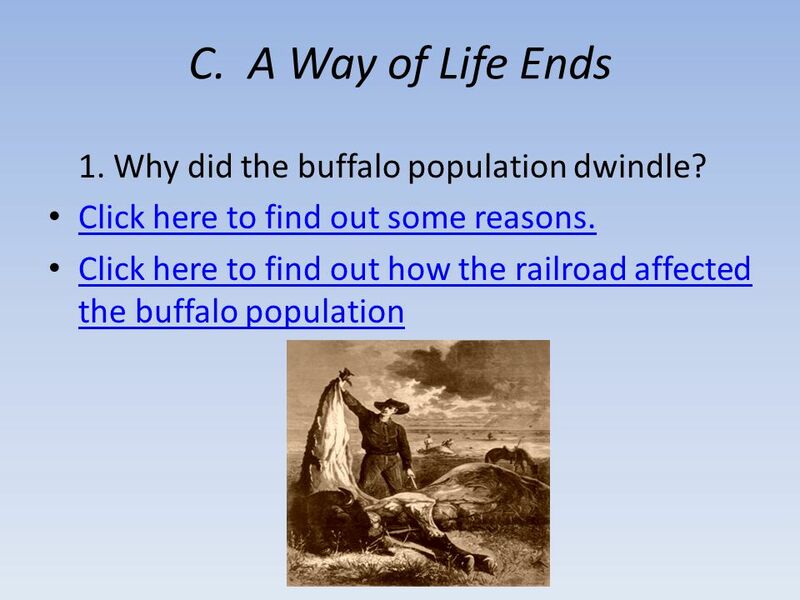 Why did the buffalo population dwindle? 21 2. 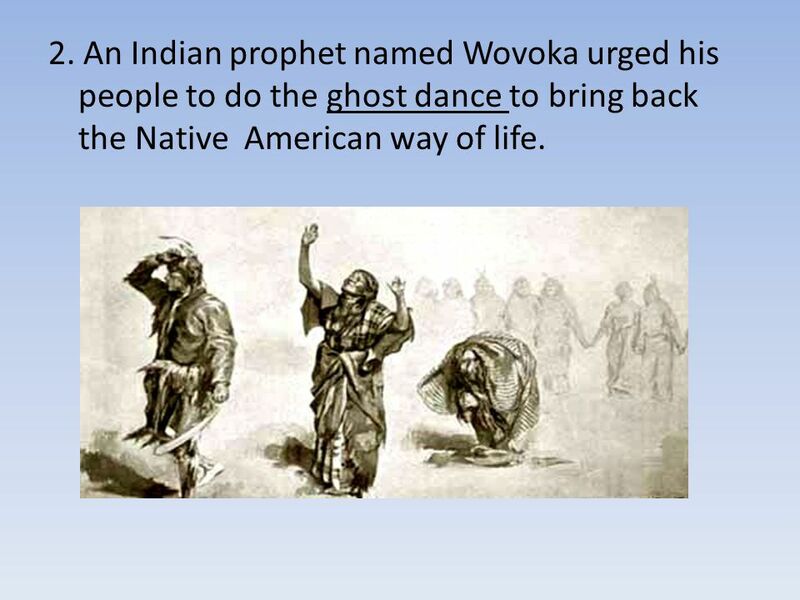 An Indian prophet named Wovoka urged his people to do the ghost dance to bring back the Native American way of life. 23 3. What did whites fear this ceremony meant? Feared a preparation for war 4. 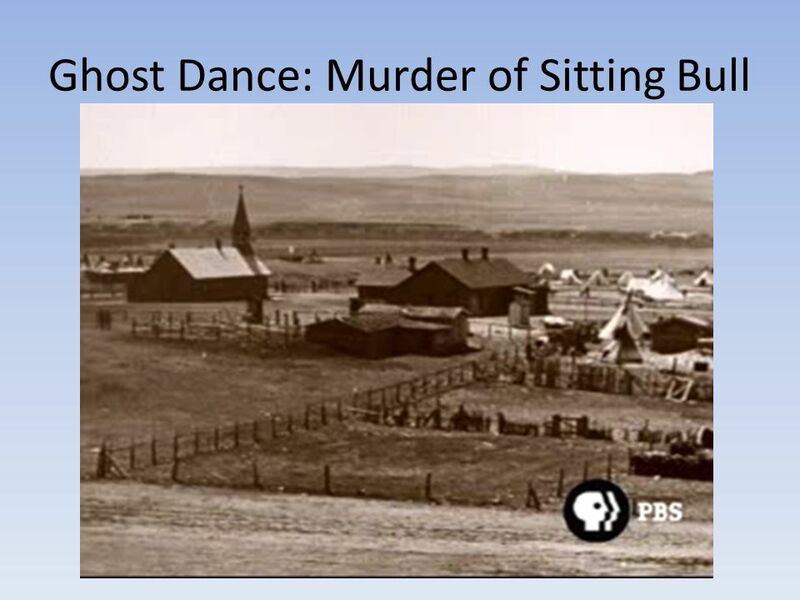 The dancers were rounded up in South Dakota. 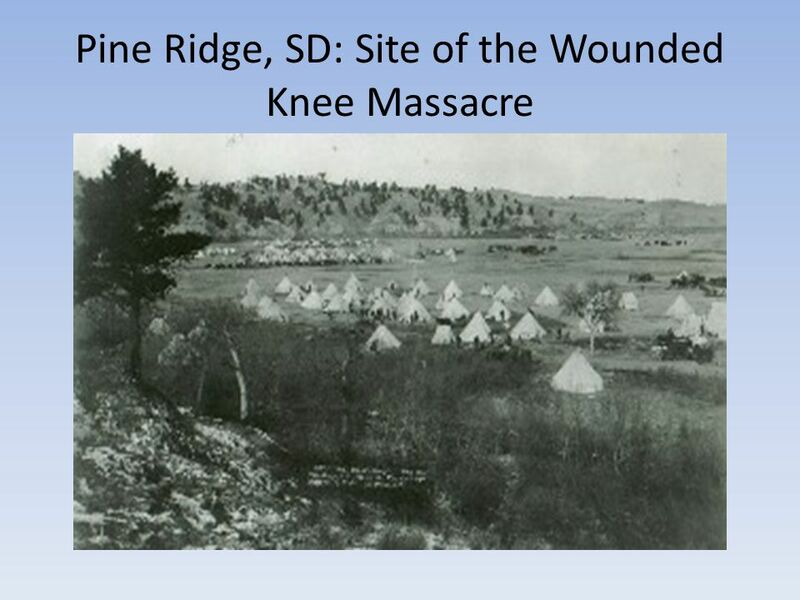 As shots were fired and the army responded,300 Native Americans were killed. 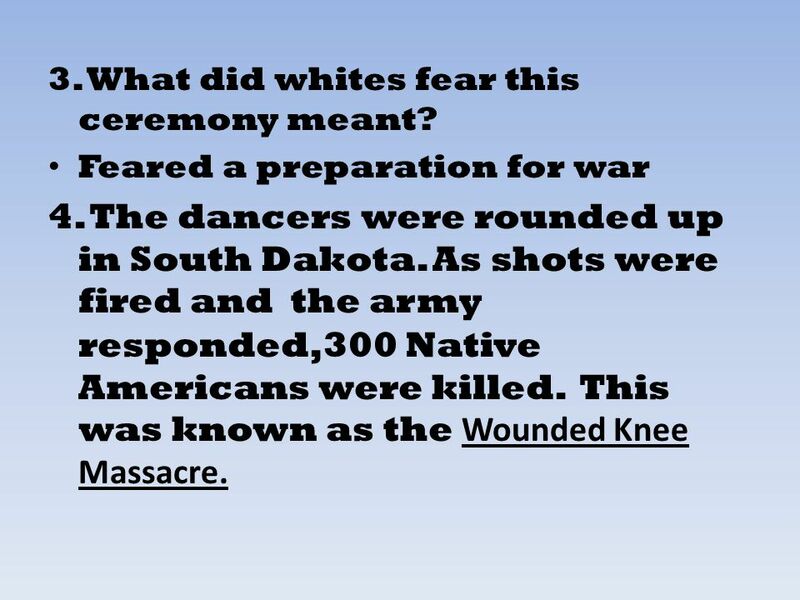 This was known as the Wounded Knee Massacre. 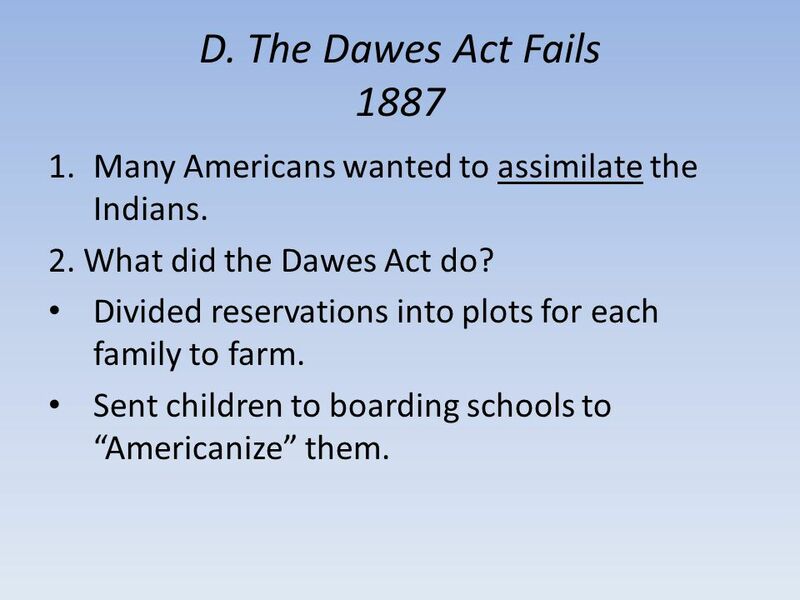 25 D. The Dawes Act Fails 1887 Many Americans wanted to assimilate the Indians. 2. What did the Dawes Act do? Divided reservations into plots for each family to farm. 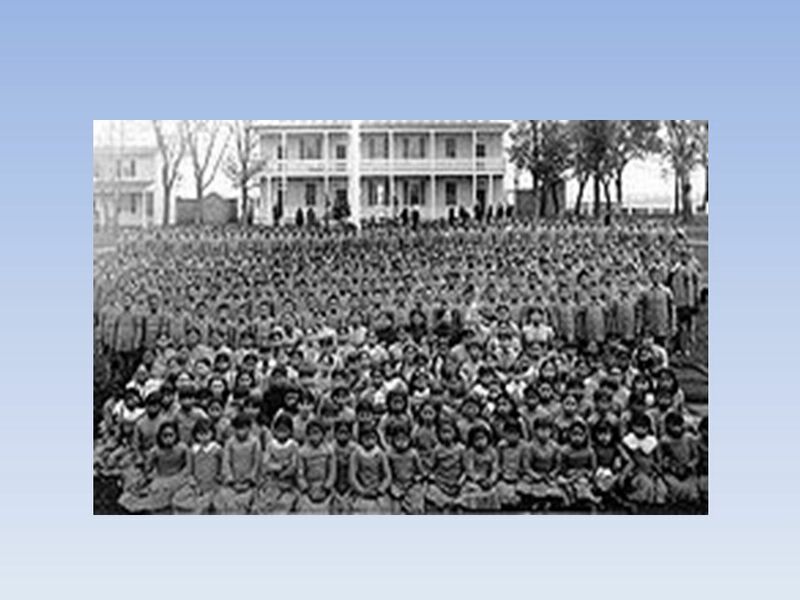 Sent children to boarding schools to “Americanize” them. 27 3. Why did the Act fail? 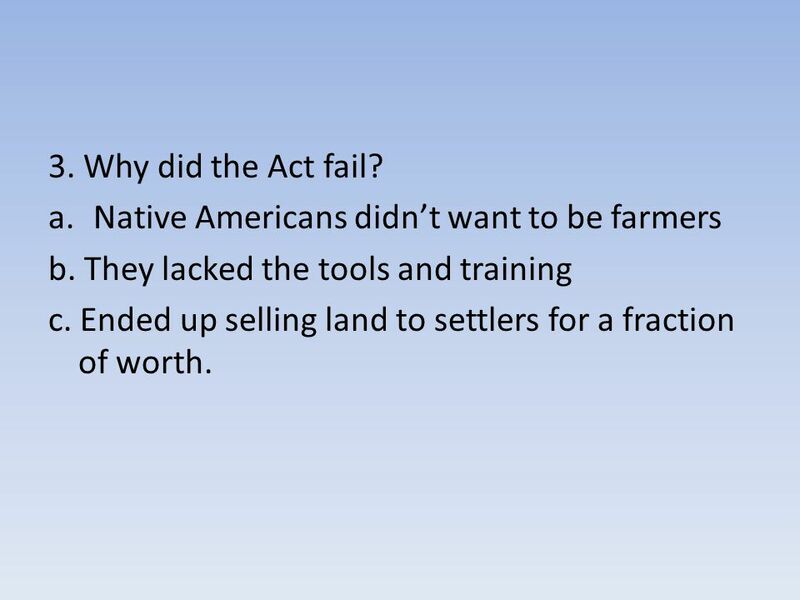 Native Americans didn’t want to be farmers b. They lacked the tools and training c. Ended up selling land to settlers for a fraction of worth. Download ppt "Ch. 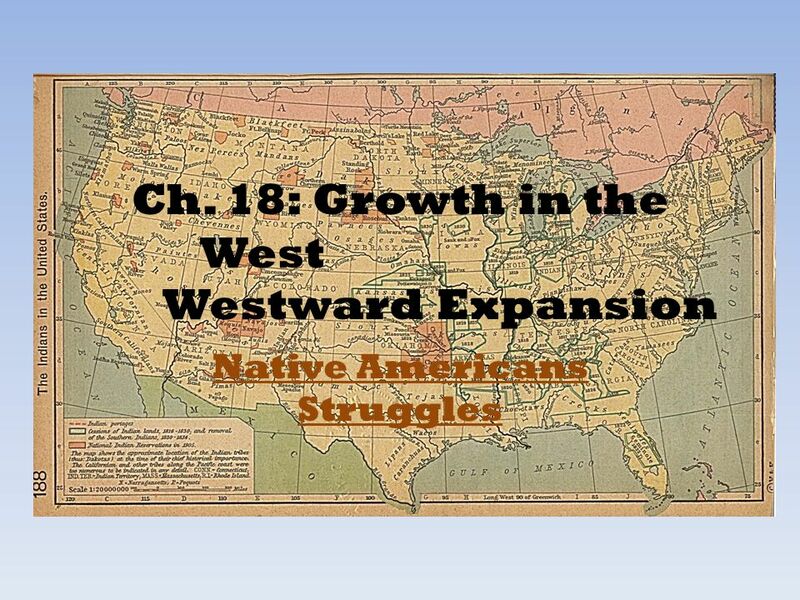 18: Growth in the West Westward Expansion"
The American West Westward Expansion and Conflict. 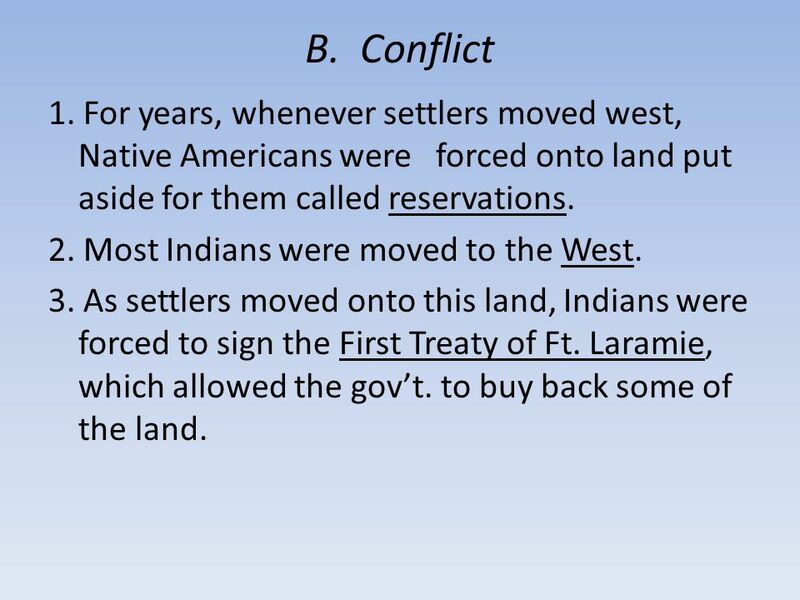 How did western settlement affect the Plains Indians? Native American Struggles Chap. 18 Sec. 3. Following the Buffalo Many white settler started coming to the Great Plains and upsetting the Native American’s. Native American life changed dramatically as a result of westward expansion Impact on Native Americans: 1.Forced to move to reservations 2.Decreased population. “HOW THE WEST WAS WON”  Plains Indians. PLAINS INDIANS  Plains stretched from Central Canada to Southern Texas  Native Tribes relied on horses and.